The Sun Lakes AZ Market Report through November 30 2015 is out. What homes are selling and how many months supply do we have? This report will answer those questions and more. Sun Lakes, Arizona is comprised of five separate communities. 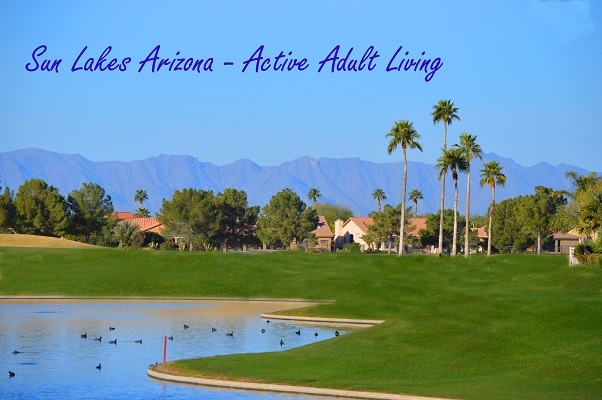 Sun Lakes Country Club, Cottonwood, Palo Verde, Ironwood and Oakwood comprise the active adult Sun Lakes community. This report will give a snapshot of Sun Lakes in its entirety. Let’s compare 2015 through November 30th to the same time period in 2014. We will compare the number of sales, average price of homes sold, the highest priced home sold, average, and highest price per square foot sold and average days on market. This report will show a slight rise in average sold prices in 2015 over 2014. 636 homes have sold in Sun Lakes through November 30, 2015 with an average sales price of $234,547. The highest priced home that sold was $850,000 and that was a custom remodeled unique one-of-a-kind home. Average sales price per square foot sold was $124.00 with the highest price per square foot at $233.99. Average days on market has been 77. Current inventory is 4.3 months supply. Currently, 203 homes are actively for sale in Sun Lakes. Compared to the 636 homes sold in 2015, this same time period in 2014 reports only 550 homes sold. The average sales price of those 550 homes is $230,714 and that is 1.6% lower than the 2015 average. The highest priced home sold during this period was $559,000. Average sales price per square foot was $123.13 and the highest price per square foot sold was $219.96. Average days on market was lower at 67 than the 2015 days. 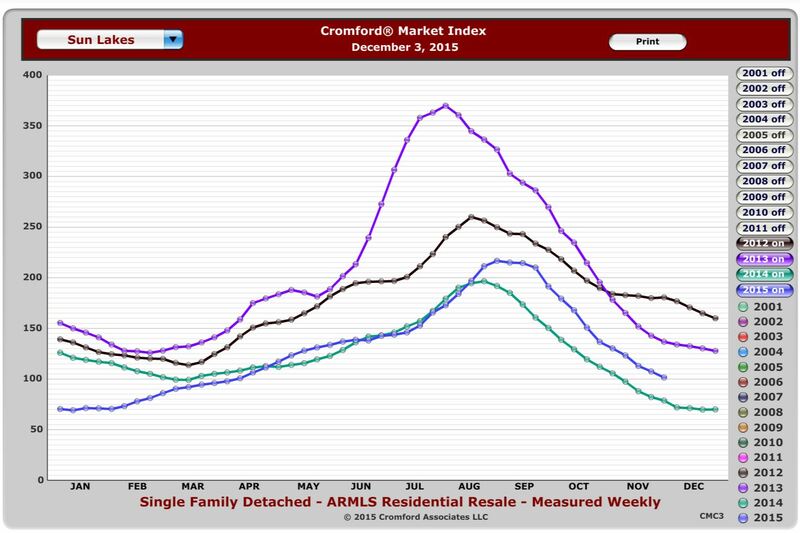 The Cromford Market Index is an indicator of buyer or seller markets. 100 is a balanced or neutral market. As of December 3, 2015 the index is just over 101. 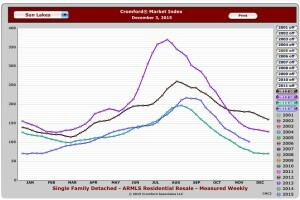 Buyer demand weakens during the holiday season and tends to increase as we enter the strongest selling season in mid January through April. The chart will illustrate a slightly higher seller advantage currently than in 2014, however, we are far from the buyer demand of 2012 and 2013. With the rise in homes sold in 2015 over 2014 we are hopeful that trend continues through the end of this year and into 2016. If you are thinking of buying a home, the time is right. If you are selling, it is critical to price your home accurately. Overpriced homes normally sell at a lower price than had it been priced accurately in the beginning. For specific reports on a particular community, call us at 480-440-0849. Sign up for new listing alerts and be the first to see what’s new in the market.